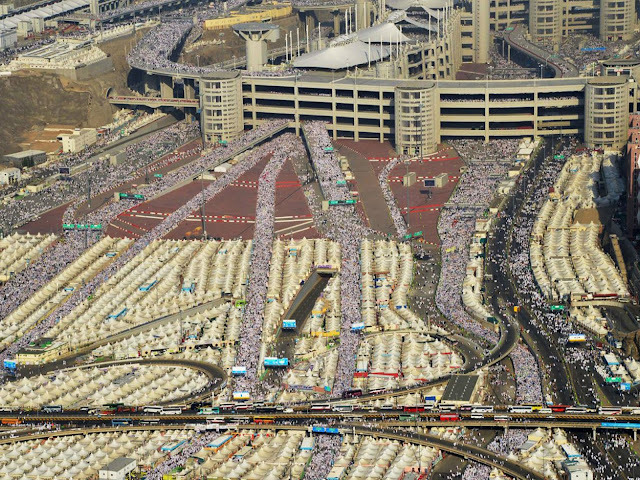 Mina is a small city, also known as “Tent City” is a neighborhood of Makkah in western Saudi Arabia. 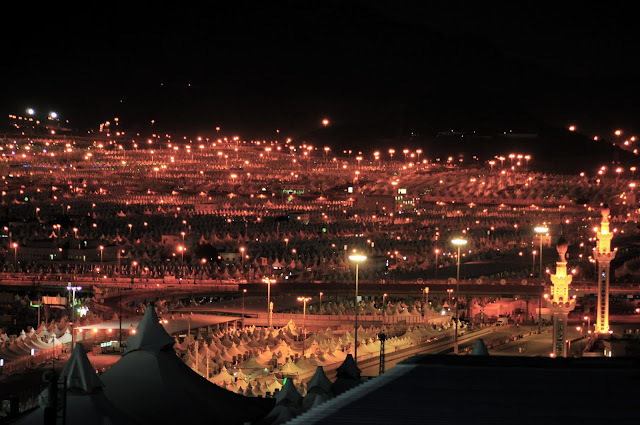 Mina is located about 5KM to the east of Holy city of Makkah, covers an area of 20KM. 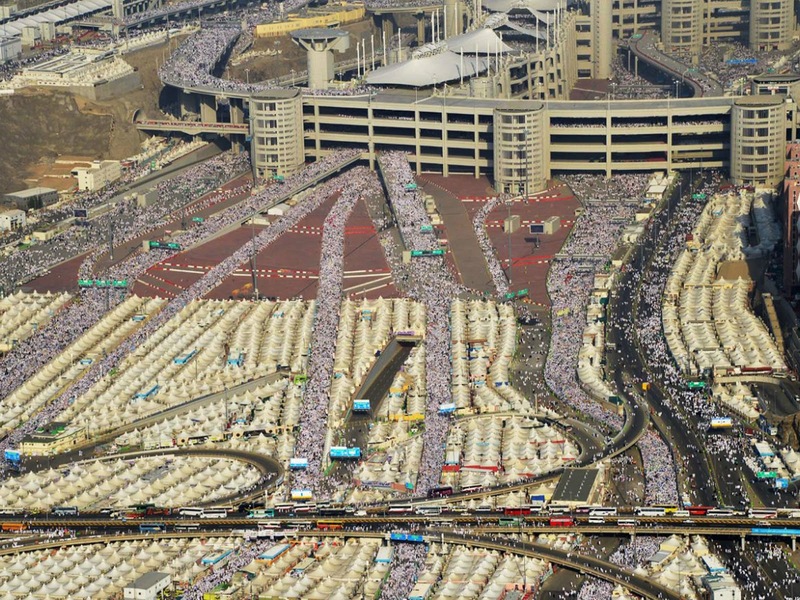 Mina stands on the road from Makkah city center to the Hill of Arafat, best known for the annual Hajj pilgrimage. 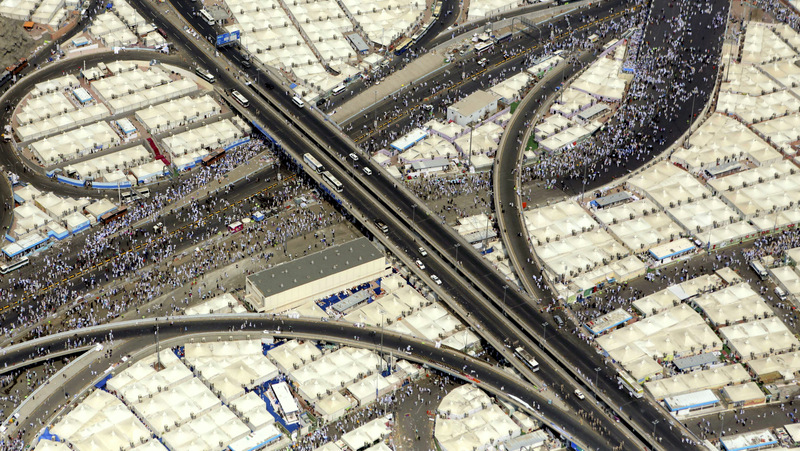 Mina is a place, where pilgrims throw stones, remembering the occasion that the Prophet Hazrat Ibrahim (A.S) stoned the Shatan (Devil) that came between him and command Allah Talah had set him. 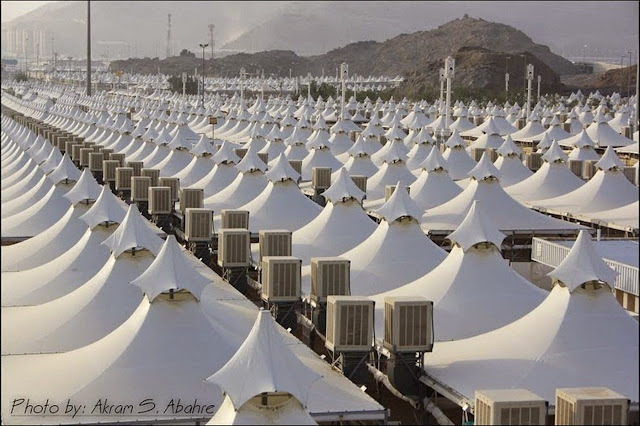 The Hajj is the ritual Islamic pilgrimage to Makkah, and Mina tent city is used for five days each year by Hajj pilgrims, and empty for the rest of the time. More than 120,000 air conditioned tents provide temporary shelter to over 3 million pilgrims during Hajj days. The Mina valley where Jamarat Bridge is located, pilgrims perform stoning to Shatan (Devil) between sunrise and sunset on the last day of Hajj. These tents cover every open space, as maximum as a naked eye can see, neatly arranged row after row. The tents measure 8 x 8 meters and are constructed of fiberglass coated with Teflon in order to ensure high resistance to fire. In the ancient times, pilgrims brought their own tents which they would erect in the flat plains of Mina. 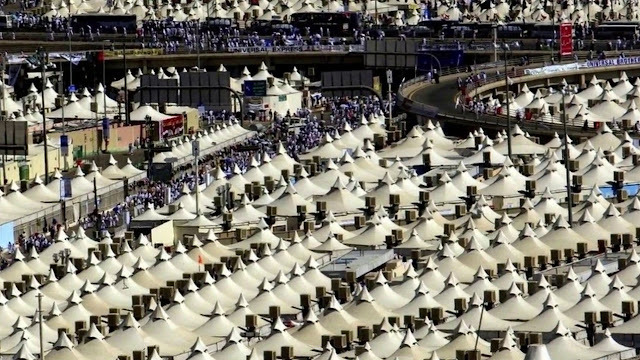 In 1990s, the Saudi government installed permanent cotton tents relieving pilgrims of the burden of having to carry their own camping equipment. 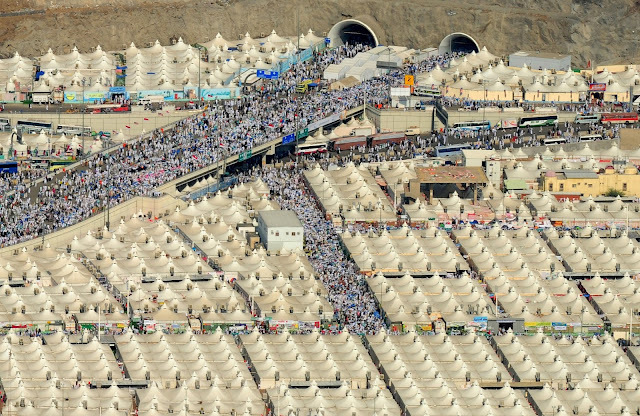 However, a massive fire that swept through the tent city killing nearly 400 pilgrims in 1997, then the current permanent fire-proof city was built. 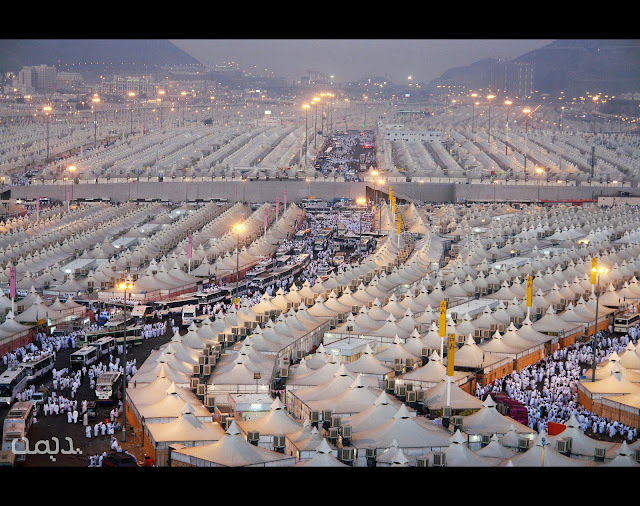 Once the Hajj is over, the tents would be dismantled, everything packed and taken back. 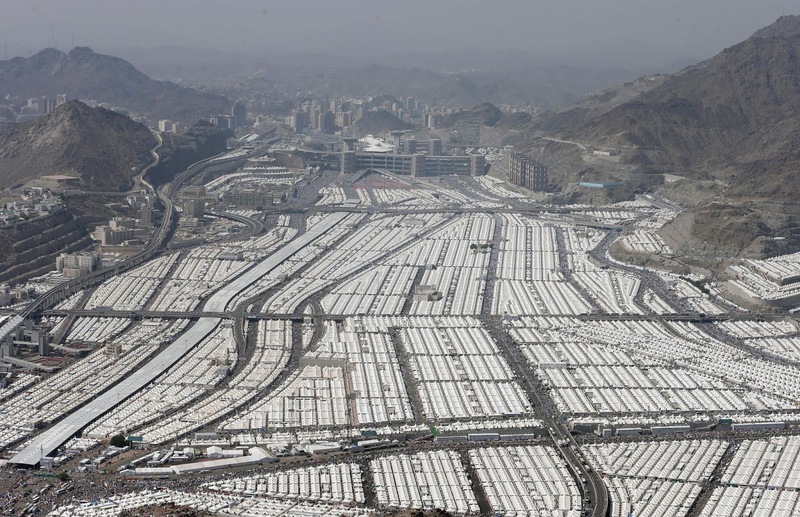 During the Syrian Civil War, the international community pressured Saudi Arabia to use its unoccupied tent city to house war refugees. 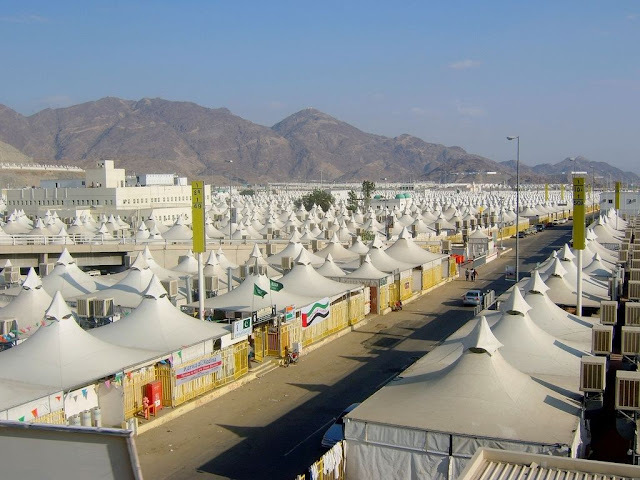 The tents are segregated into a number of camps, as each of which possess its own exterior wall, and is linked to other camps by pathways. The camp provides the facility of a kitchen, bathrooms, and ablution facilities. 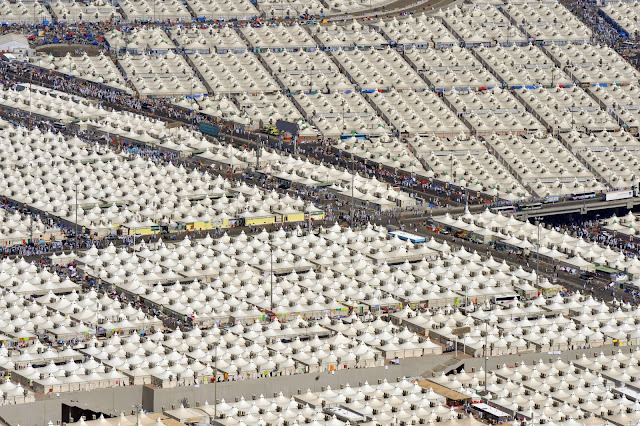 For the pilgrims ease, every tent is color-coded by country and numbered, and all the haji’s are supposed to have badges with their color and number on it, in case they get lost. In past few years, Saudi government investing huge amout of money to improve the infrastructural projects to ease the daunting and physically demanding rituals of the annual pilgrimage. A comprehensive fire safety network containing of heat-sensitive water sprinkler are linked to an alarm system was implemented to avoid the repeat of 1997 tragedy.